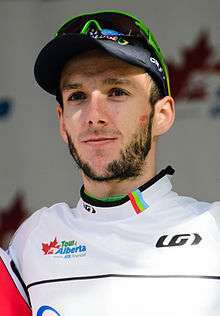 Adam Yates (born 7 August 1992) is a British road and track racing cyclist and twin brother of Simon Yates. He currently competes for the Orica–BikeExchange team. At the 2016 Tour de France he placed fourth overall and won the young rider classification, becoming the first British rider to win that classification. Adam and Simon took up cycling after their father John was injured in a collision with a car while riding – during his recovery he took the twins to Manchester Velodrome to track sessions run by his cycling club, Bury Clarion, to keep in touch with the other members. Both brothers soon started riding on the road for Bury Clarion and on the track for Eastlands Velo. Whilst Simon was selected for the British Cycling Olympic Academy programme, Adam pursued his road racing career in France with financial help from the Dave Rayner Fund. Yates finished second by just 55 seconds to Spanish rider Ruben Fernandez in the general classification of the 2013 Tour de l'Avenir whilst representing the British national team. 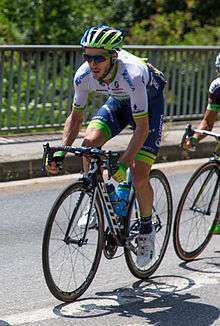 Having spent a successful season with French amateur team CC Etupes, he joined the Australian UCI World Tour team Orica–GreenEDGE along with his brother in 2014. In his first professional race, the Tour de San Luis in Argentina, Yates finished eleventh overall and first in the young rider classification. Yates' breakthrough results came at the Tour of Turkey in late April and early May 2014. He had been one of the team's protected riders for the general classification, along with his brother. 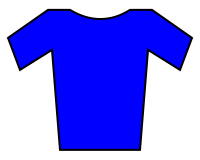 On the third stage, he became the team's de facto team leader, after Simon crashed out of the race, resulting in a suspected broken clavicle. Yates was the only person to follow an attack by Rein Taaramäe on the final climb to Elmalı, and ultimately finished the stage in second place, six seconds down on Taaramäe after he had attacked again in the closing metres. After two stages that suited the sprinters, Yates achieved his first professional victory on the sixth stage, finishing at the House of the Virgin Mary in Selçuk. A reduced peloton had formed on the final climb from which Yates attacked with around a kilometre remaining. Yates held off the chasers – led home by Davide Formolo and Davide Rebellin, two seconds in arrears – and was able to take the leader's blue jersey from Taaramäe, who crossed the line seven seconds behind Yates. Yates held the race lead until its conclusion in Istanbul two days later; he extended his lead by a further four seconds on the final stage, as there was a split on the run-in, with only a 28-rider group being given the same time as stage winner, Mark Cavendish. He later described the victory – the first British overall win at the Tour – as "unexpected", having set out with the ambition of winning stages. Yates next competed at the Tour of California. After being passed on the road by Bradley Wiggins (Team Sky) on Stage 2, the 20 km individual time trial around Folsom, he finished fourth on Stage 3, which finished on Mount Diablo, and fourth on Stage 6, which finished on Mountain High. Yates finished fifth overall in the general classification, 2 minutes and 14 seconds behind the winner, Wiggins. Yates' impressive form continued at the Critérium du Dauphiné, where he placed eighth on the first mountain top finish on Stage 2. He finished third on Stage 5 after launching a late attack with Wilco Kelderman (Belkin Pro Cycling), and again finished third on Stage 8, a mountain-top finish at Courchevel. Yates finished the UCI World Tour race sixth overall. Orica GreenEDGE decided not to select Yates for the Tour de France, and he instead was rested for a few weeks. He returned to racing at the GP Industria & Artigianato in July, which he won to take his first one-day professional victory. Yates made the lead group at the Clásica de San Sebastián with Alejandro Valverde (Movistar Team), Bauke Mollema (Belkin), Joaquim Rodríguez (Team Katusha) and Mikel Nieve (Team Sky), but crashed heavily on a descent with 3.5 km remaining, missing out on the chance of his first World Tour victory. He made his Grand Tour debut at the 2014 Vuelta a España, which he managed to complete, finishing 82nd overall. He was named in the start list for the 2015 Tour de France. He finished seventh on Stage 8, which finished on the Mûr-de-Bretagne, and seventh on the first mountain stage, Stage 10, which finished on the Col de la Pierre St Martin in the Pyrenees. On 1 August 2015, Yates took his biggest victory to date by winning the Clásica de San Sebastián after attacking on the final climb as leader Greg Van Avermaet of BMC was involved in a crash with a race motorcycle, and holding off the chasers on the descent into San Sebastián. In the confusion after Van Avermaet's crash Yates did not realise he had won, so did not initially celebrate when crossing the finishing line. Yates was selected to ride the 2016 Tour de France. On Stage 7, Yates broke clear of the leading group of GC contenders on the descent of the Col d'Aspin, but was involved in an accident when the inflatable Flamme rouge marking 1 km remaining of the stage deflated as he rode underneath it. Yates suffered cuts to his chin requiring stitches, but after the stage results were revised to give him the 7 second advantage he had over the peloton with 3 km to go, Yates rose to second overall and took the White Jersey as leader of the Young rider classification from Julian Alaphilippe (Etixx–Quick-Step). On Stage 9, which was the first mountain top finish of the race at Andorre Arcalis, Yates finished tenth, leading home a select group of GC contenders including Chris Froome (Team Sky), Nairo Quintana (Movistar Team), Richie Porte (BMC Racing Team) and Daniel Martin (Etixx-QuickStep). This meant Yates sat second overall going into the first rest day, 16 seconds behind Froome, and led the Young Rider's classification by 39 seconds over Louis Meintjes (Lampre–Merida). ↑ Fotheringham, William (19 July 2016). "Adam 'The Shadow' Yates shows he is a future force in the Tour de France". theguardian.com. Retrieved 19 July 2016. 1 2 3 "Adam Yates". Retrieved 15 April 2015. 1 2 "Yates Brothers Confirm Move To Orica-GreenEdge". Cyclingnews.com. Future plc. 3 October 2013. Retrieved 3 October 2013. ↑ Slater, Matt (27 September 2014). "Simon and Adam Yates: Bury boys on a twin track to the top". bbc.co.uk. Retrieved 28 September 2014. ↑ "Adam Yates Wins Best Young Rider at Tour de San Luis". Orica–GreenEDGE. GreenEDGE Cycling. Retrieved 27 January 2014. ↑ "Adam Yates Climbs to Second on Tour of Turkey Queen Stage". Orica–GreenEDGE. GreenEDGE Cycling. 29 April 2014. Retrieved 5 May 2014. ↑ "Simon Yates crashes out of the Tour of Turkey". Cyclingnews.com. Future plc. 29 April 2014. Retrieved 5 May 2014. ↑ Wynn, Nigel (29 April 2014). "Adam Yates climbs to second behind Rein Taaramae in Tour of Turkey". Cycling Weekly. IPC Media. Retrieved 5 May 2014. ↑ "Yates wins stage 6". Cyclingnews.com. Future plc. 2 May 2014. Retrieved 5 May 2014. ↑ "Adam Yates takes Tour of Turkey lead with superb solo victory on stage 6 summit finish". Sky Sports. BSkyB. 2 May 2014. Retrieved 5 May 2014. ↑ "Yates secures overall success at Tour of Turkey". Cyclingnews.com. Future plc. 4 May 2014. Retrieved 5 May 2014. ↑ "Adam Yates says Tour of Turkey triumph was unexpected". BBC Sport. BBC. 5 May 2014. Retrieved 5 May 2014. ↑ "Tour of California 2014, stage six: Sir Bradley Wiggins tightens grip on leader's jersey after mountain-top finish". Telegraph.co.uk. 17 May 2014. ↑ Daniel Benson. "Yates impresses in Dauphiné mountains". Cyclingnews.com. ↑ "7. Adam Yates (Orica-GreenEDGE)". Road Cycling UK. ↑ "Adam Yates wins GP Industria & Artigianato in Italy". Cycling Weekly. 26 July 2014. ↑ Cycling News. "Yates injured in Clasica San Sebastian crash". Cyclingnews.com. ↑ "Adam Yates to ride in the Vuelta a Espana". Cycling Weekly. 22 July 2014. ↑ "2015 Tour de France start list". Velo News. Retrieved 2 July 2015. ↑ "Tour de France 2015: Stage 8 Results - Cyclingnews.com". ↑ "Tour de France 2015: Stage 10 Results - Cyclingnews.com". ↑ "Adam Yates wins Clásica de San Sebastián - without knowing it - Cycling Weekly". 1 August 2015. ↑ "Tour de France 2016: Adam Yates second overall after result revision". ↑ "Tour de France 2016: Chris Froome retains lead as Tom Dumoulin wins stage nine". ↑ "Tour de France 2016: Stage 9 Results - Cyclingnews.com". Wikimedia Commons has media related to Adam Yates (cyclist).